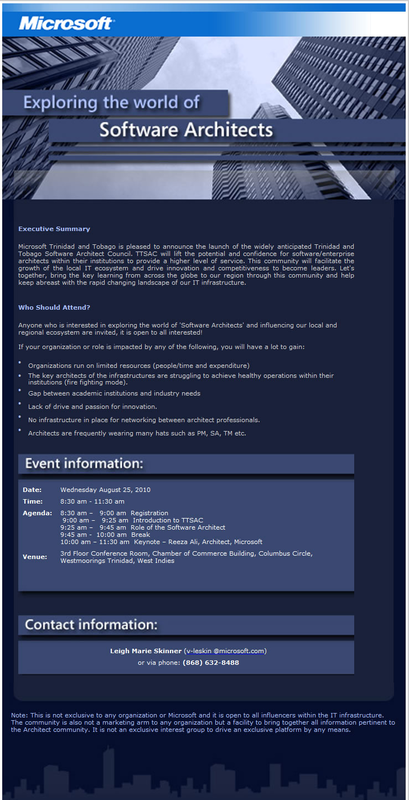 On the 25th of August 2010, TTSSUG will be holding its second meeting and Microsoft Trinidad and Tobago will be launching a new committee, the Trinidad and Tobago Software Architect Council (TTSAC). 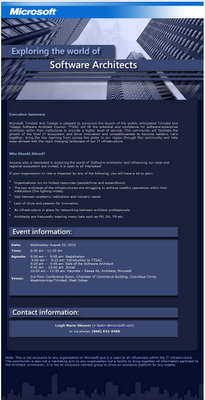 The TTSSUG meeting would be focusing on Microsoft SQL Server Integration Services (SSIS). SSIS is a platform for building enterprise-level data integration and data transformations solutions and is an important component of The Microsoft Business Intelligence Platform. This meeting is recommended for Developers, Database Developers and Database Administrators. See the invite below for more details. The TTSAC launch will give insight on how this new community can facilitate the growth of the local IT ecosystem and ignite the drive for innovation. This meeting is recommended for Software and Enterprise Architects. See the invite below for more details.